Charles Scurr and his staff at the Citizens Independent Transportation Trust say they want to help give Miami-Dade residents the public transportation system they deserve and that the county needs to thrive. However, with most of the tax revenue at their disposal committed to fixed expenses for years to come and no new taxes on the horizon, they’re looking for creative partnerships to help get future projects underway. The first major project to be accomplished through a public-private partnership could be the proposed rail line from Miami to Miami Beach, said Mr. Scurr, the trust’s executive director. With high ridership on the line practically a given, he said, it shouldn’t be hard to attract interest from the private sector. And the partnership could go beyond a normal construction and operating agreement to one that also offers a private partner the opportunity to develop property along the route. “The private sector has the ability to be much more creative, more efficient and more entrepreneurial,” he added. In a recent interview with Miami Today in his 10th floor office at Government Center, Mr. Scurr discussed how People’s Transportation Plan tax revenue won’t be nearly enough to fund big projects and smaller, widespread improvements to public transportation in Miami-Dade. As the trust’s top administrator, Mr. Scurr heads a 15-member panel that oversees revenues generated through the People’s Transportation Plan surtax. The surtax is a half-penny increase in the county’s sales tax that local voters approved via a November 2002 ballot referendum to pay for expansion of the county’s existing public transit systems, as well as projects to create new services. Another kind of partnership, he said, could involve the Miami-Dade Expressway Authority for a project to enhance public transit along one or more of the county’s main east-west corridors. Such a partnership probably would involve a bus rapid transit system with dedicated bus lanes to speed up trips. Although bus rapid transit is considered a lower-level project, it could set the stage for the bus lanes to be eventually converted into a rail line whenever funding becomes available, Mr. Scurr said. Ironically, revenue from the half-penny surtax has been increasing in recent years and is expected to do so for years to come. Annual revenue from the surtax rose to roughly $215 million in the last fiscal year and is projected to be about $225 million for the current fiscal year. Mr. Scurr’s office also projects increases through 2030, when surtax revenue is expected to near $400 million. Yet, there still won’t be much left for new projects. One reason is that a percentage of People’s Transportation Plan revenue has gone to Miami-Dade Transit’s operating budget each year since the program began rather than being set aside completely for new projects. The percentage of annual surtax revenue used to fund existing transit operations peaked in 2009 at 32%. The percentage has leveled out at 19% or 20% from 2012 to this year. However, the biggest chunk of surtax revenue each year goes to paying off lingering debt from bond sales used to finance People’s Transportation Plan projects during the program’s early years. 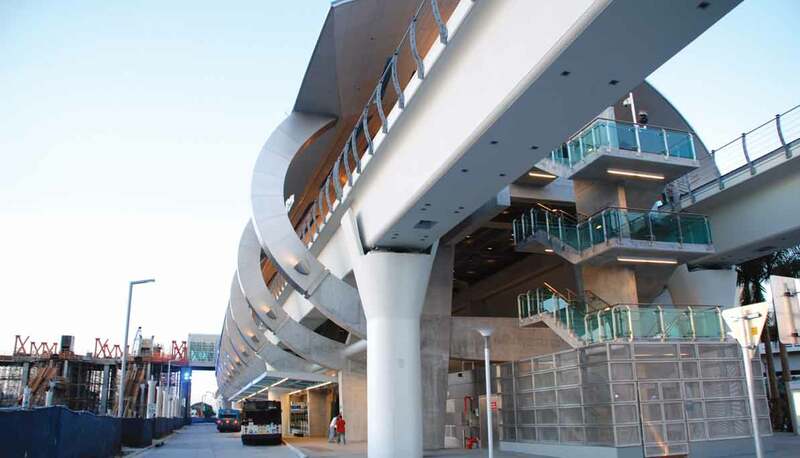 Otherwise, Mr. Scurr said, the county would have had to wait years to accumulate enough surtax revenue to pay for big projects, such as the $506 million Metrorail Orange Line extension that linked Dadeland in the Kendall area to Miami International Airport. About $70 million of this year’s surtax revenue is earmarked for debt service from the bond sales. And debt service is projected to escalate to $150 million a year by 2020 and to stay at that level at least until 2030. Starting in 2022, when the program’s bond capacity increases, the annual debt service payments are also projected to rise, eventually reaching more than $200 million a year in 2029 and beyond. Another big chunk of the annual surtax revenue – currently roughly $50 million a year – goes to 34 municipalities around Miami-Dade, earmarked to them to address their individual transportation needs. After other fixed expenses and debt are taken away, Mr. Scurr said, only about $96 million will be left over this year to actually help operate and maintain the transit system. Not mentioned in the article is how much of the PTP money has gone in to ROAD CONSTRUCTION projects (see the 10-year report and 5-year plan online). That money alone could at least be used for bus shelters, bus bays, and new busses. Not to mention the $50M/year that is going in to useless “community shuttle” service that only runs every 1-2 hours… Bus lanes are pretty cheap too–they are just paint and signage, after all! There is plenty that we can do to improve mass transit without spending hundreds of millions on rail expansions, if we just had the leasership to prioritize the transportation tax money that we already have coming in. Finally, the CITI should be taking a more activist role and DEMANDING that the County step up and cover maintenance and operating costs (instead of Port tunnels and signature expressway bridges and express lanes and MDX highway expansions) so the PTP money can be used for actual expansion–this is after all, what we voted for back in 2002. Run a recall election campaign on all commissioners and elected officials who are opposed to what the public voted for. Expose the waste in County expenditures that should be used for maintaining our infrastructure. Here’s an idea: pick up the phone, call Disney. Tell them if they chip in to build a Disney-style monorail (costs shared between the county/cities/state/Feds/and the Mouse) to connect the mainland with the beach they get to build a hotel at both ends of the route that includes a station on Watson Island where they can berth one of their cruise ships. Favorable tax incentives are a given. Perhaps CITT should look into a I195 Metro-Rail line. The corridor along 36st St. into I195 brings multiple private partnership opportunities. The line should end on the MBCC. Most of the r-o-w will be at grade. The line would serve Midtown, Design District, Upper Biscayne, Mount Sinai Hospital, close to Fontainebleau and end at the renovated BMCC. It will also make available the Tri-Rail connection and airport to those important centers. Duped by the county – I reluctantly voted for the extra tax that has resulted in lies…where are all the rail lines the tax was supposed to fund? It was a sham and I guarantee you I will never vote for another tax increase again. Dupe me once, shame on you…dupe me twice, shame on me.